This time it’s Asiago cheese, a hard Italian cow’s milk cheese (the cheese is hard, not the Italians, or maybe they are). It’s from an area NW of Venice, best thought of as an alluvial fan off the Alps. Aviano AB is on the NE side of the region. I flew over this area in C-130’s, carrying paratroops to the Maniago Drop Zone. It didn’t look particularly pasture like. In any event the cheese is solid-to-crumbly, is OK on crackers, and melts only slowly. This time the setup was 3/4 cup chicken stock, 1/4 cup Pinot Grigio, maybe a 1/4 cup of the cheese, put in early enough that it melted in. Potatoes to thicken. No salt. The cheese has enough for all. Result: OK. The wine and chicken combo are always good, and the cheese added a….cheesy…flavor. A bit of ground black pepper helped, but certainly not as much as Marco Polo put in his. If you like Asiago cheese, you’ll like this. Cool weather, becoming hot and thundery, and rainy. Did a lot of work on Section 2 of the keyhole garden. 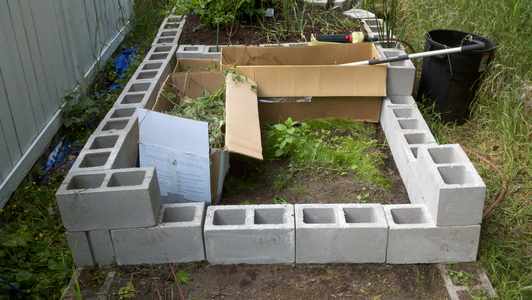 Got the cinderblock laid. Very uneven, due to the four-year old foundation having shifted and me being too lazy to dig it out again. Note that it is not at all round, because I’m using an existing garden and foundation. Moved the boxes into the enclosure. 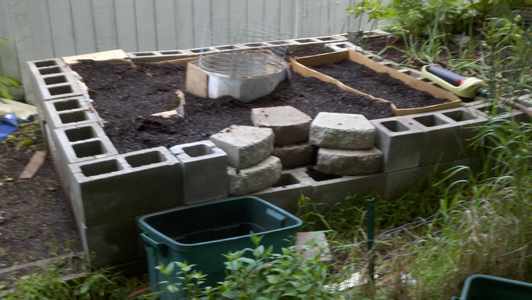 I then continued to fill them with home-made compost — I dumped in the small garbage can you see on the right. I’d been using it to compost stuff. Bottom two feet (say, two months old) were completely soil-like. Top two feet completely garbage-like. Covered it up with more broadleaf weeds, 30 lb of coffee grounds, a pound or so of charcoal fines. Went down to the recycling center, and found that their sale is next Friday, but that a local (new) landscape company sells their stuff for not much more. Got about three garbage cansworth into the back of the Ford Focus, and dumped two of them on the garden before the heat (80F, I know, I’m a wimp) got to me. I was going to let it slide until Saturday, but remembered what I’d learned about mowing lawns in VA in the spring — do it now. So that evening I went out and finished the job. Glad I did. That night we had t-storms come through, which wetted everything down nicely. Saturday I got another load of compost. Just barely filled the KHG to the tops of the blocks, with nowhere near enough for the central volcano. I almost decided to let it go at that, and build up with potting soil as the summer goes on, but we had some heavy rain overnight, and today I think I’ll wait until the compost shop opens on Tuesday — it really does need another load. I think that’s because I had more massive inputs last time — like a large box of telephone books, etc. Two loads of compost and two days of rain. I need at least one more of each. I have about 20 bean plants sprouted and waiting to go in to Section 2, along with five or six various squashes. Most of this section will be planted to summertime greens — chard, kale, amaranth. I figure I’ll plant just one side, with all those plants, then in a couple of weeks plant a remaining corner in greens, and a final corner in greens at the end of July. Everything growing is growing well, but the lettuces are the only thing producing. My lettuce planter is 8x8x36″, planted with a lettuce combo. I found that if I give a 6″ or so section of it a haircut, right along the top of the planter, I get enough for a small salad; and if mixed with some store-bought iceberg and spinach, two normal salads. By the time I’ve worked my way to the end of the container, the first cut region has regrown. We’ll see how long the lettuce can keep this up before it gets discouraged. Some of the lettuce in the KHG is now big enough to start thinning. Tomatoes doing OK. Some are starting to flower, but no fruit yet, and probably not until August. Carrots in the deep container haven’t sprouted at all. Might have planted too deep. I’ll try again later this week. Short answer, I have no idea. Yesterday I had 83 visits – the busiest day in the history of this blog – instead of my usual ten, and 67 of them were looking for Golden Curry images. What’s with that? Golden Week was months ago. Another impulse buy (whenever MJ goes off on an AKC trip I go wild, see last week’s entry). This time it’s Beecher’s Marco Polo cheese. It’s a standard mild cheese, with lots of ground pepper. Named by the marketing department for Marco Polo, who brought pepper back from China. Funny, I thought it was from India and was known well before that. It’s an OK tasting cheese that appeals mostly to pepper lovers. Kindof like jalapeno cheese. 3/4 cup water, 1/4 cup red wine, 1/3 cup long cook oatmeal. At the 12min point I chunked up slightly less than 1/4 cup of the cheese and put it in to melt. Two tsp potato flakes. Result: Not bad. If I liked pepper better, I’d like this better. The cheese was fully melted and was more of a thickener. Had to add a couple more teaspoons of potatoes. My interest was piqued by this article on drone bases in the US. Formerly called UAV (Unmanned Air Vehicles) by the military, they are now known as Remotely Piloted Aircraft (RPA) — less sexist, and likely a better fit for the bureaucracy because they now fit a known pigeonhole. In particular, the map shows a SOCOM ScanEagle operation at Arlington, Oregon. I’ve driven through there on my way to Portland. It says “Welcome to Arlington” on both sides of the sign. It hosts a grain-loading facility on the Columbia River, plus some stores that, as someone once said, sell gas and snacks to truckers who stop to deliver gass and snacks. The cost of building the highway exit from Interstate 84 was probably higher than the value of the town. What possible thing could SOCOM be doing there? What’s worse than having a flight delayed? Having a flight delayed that a world-famous management guru is scheduled to take. What’s worse than having a flight delayed that a world-famous management guru is scheduled to take? Having a flight delayed that a world-famous management guru is scheduled to take, and having the service staff evaporate without telling anyone anything. We are finally starting to get decent weather. Still cloudy and cool, but with some sun. Trying an experiment with the cinderblock holes in the KHG. I have probably 9 or 10 spare tomato seedlings, including some Sweet 100 cherry tomatoes. So I stuck two of them in the holes. If they don’t do well, well, c’est l’guerre. This weekend started work on Section 2 of the KHG. Right now, it still has some peas, but they aren’t coming along fast enough to be worth keeping. Peapod salad, Wednesday! First step was to start putting up the cinderblock. I have one side done. Second side happens today. Endplate goes on Wednesday. A year ago I cut the weeds by the birdbath down to the dirt, and planted oregano. So I’ve started cutting the weeds and filling the boxes with them and leaving them out for the rain that’s cast for midweek. 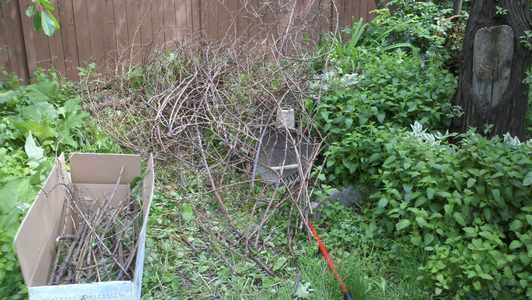 Also cutting up an old feral rosebush that I pulled up last year. That adds more brown. As I load the garden I plan to run the sprinkler on everything. The remaining brown will be crumpled newspaper and shredded letters. Last time my problem was getting enough green. This time it will be getting enough brown. All the liquor store boxes have been snapped up by moving students. A small barrel of composting kitchen compost adds more green, as will three weeks of barista coffee grounds. A bin of charcoal dust that I’ve been collecting for the last couple of years will add more brown. I use real wood chunk charcoal, none of that chemical pressed briquette stuff. Otherwise, things grow. Put some cornmeal around the smaller seedlings to keep off sowbugs. Picked up a packet of “compact plants” that I’m going to try on the deck — cantaloupe, watermelon, summer squash, cucumbers. We’ll see. Father’s Day is a nice marketing opportunity. It makes the men feel not left out. If provides a nice income stream to tide merchants over the dry season between Mother’s Day and the 4th of July. Most of the stuff advertised is a good example of marketeers trying to create demand where there is none. Case in point is men’s shaving products, bought by women for men: preshave, lotion, cream, aftershave, and so forth. I don’t know of anyone that uses the stuff, at least, not anyone I’d admit to knowing. Decades ago, my then-fiancee sent me some of these products for my birthday. In my youth and innocence I tried them, following the instructions on the box. The result? People were coming in from the hallway saying “What’s that smell?” Face it. That stuff is perfume for men, and should be applied in the same way – a dab behind each ear and one in the cleavage, if you can reach around that far. Case in point is manly BBQ gear. Not so much the grills, they almost rate as consumer durables and so are too expensive for mere Father’s Day gifts, but the accessories. Men see themselves as primal beasts, bravely searing large chunks of meat over an open fire, just like great^12 grandfather Ugg did. For large chunks of meat you need large tools. Two foot long forks with four inch tines, as a peavey to stab and roll that side of beef. Eighteen inch tongs to reach through the flames. Two inch diameter BBQ sauce brushes to slather the sauce on like you had been hired by Tom Sawyer. Well, no. If you have that kind of flames, you need an Amerex product, not something by Weber, or God Help Us, this monstrosity. Standard kitchen tongs work fine. A granny fork is the biggest thing you need, or maybe a 9″ kitchen fork. Anything else is overkill. POST FATHER”S DAY ADDENDUM: I just had to add this. Not just big tools, but Three Musketeers-worthy tools! Don’t you hate it when the BBQ singes off those few knuckle hairs that didn’t get worn off on the floor? Working at using up the seafood stock I opened for last week’s oatmeal, I decided to go minimalist and just make plain oatmeal using seafood stock and no additions. That good intention lasted about two minutes, and then I decided to see what a seafood curry might be like. I then managed to resist the urge to run down to the store and buy a quarter pound of ground squid as an additional addition. So, oatmeal, cup of seafood stock, tablespoonish of Golden Curry, two teaspoons of potato flakes. Result: Not….bad. The flavors kindof heterodyned (and I don’t mean Agatha). A drip of lime ponzu sauce didn’t entice me to put any more on, but a splash of plain old soy sauce pulled things together nicely. I don’t think I’ll try it again, unless I have some other additive to experiment with. Back in August of last year I calculated that if the top 400 US taxpayers had their taxes increased to G.W.Bush levels, that would add $7 Billion to our government’s income. Now, Sam Pizigatti over at Campaign for America’s Future, notes that if the top 400 in 2009 were taxed at 1955 rates — from, you know, the Eisenhower years — the USG would have an additional $25 Billion to help dig us out of the Great Recession. Of course, in order to make that number commensurate with my original estimate, we’d have to subtract that $7 Billion, and so be left with a mere $18 Billion increase above my estimate. If those numbers hold down the line, a return to the Eisenhower tax rates over ten years would net the government an additional $3 Trillion above my original Buffett Rule estimate, or $4.5 Trillion total. That’s about a third of our current public debt. Meanwhile, our top 400 taxpayers would still be taking home $90 million more apiece than their 1955 forebears did. Just sayin’. This whole week has felt like it was March. We had highs in the 40s, and winds in the 20s, and rain pretty much all the time. No pouring, just too much to work in the garden in the wind and the cold. Sunday was clear and cold and breezy, like early October. Too bad I didn’t put in pumpkins. The plants are all doing OK. Too cold to expect greatness. One of the peas died, and one of the long beans in the KHG was stripped by something, that left the other two alone. The asparagus is showing three or four foot-high pencil-thin stalks already. I bought some peppers (yellow banana) and a dill plant at the local hardware store’s Dump Our Old Plants Sale. They all survived the transplant into the KHG. I was worried about the rain eroding my KHG volcano, but it seems to have held up well. Time to take another picture, but I’ll have to weed first. Probably won’t happen until sometime next week, ’cause we are into Finals and such. Over in the graveyard of the hops, I have some of the replacement flowers just starting to show. I am ready to close down the seed sprouting setup. Maybe one more increment to get things ready for the Section 2 KHG, which will be the last Friday in June, just over two weeks away. 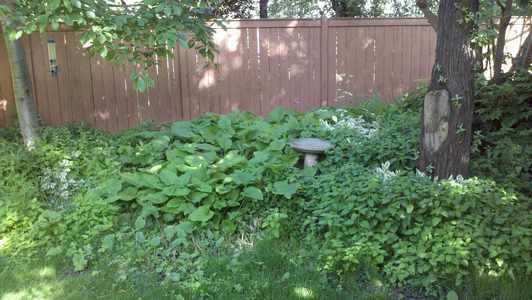 I am thinking I can build a new section each end-of-month compost sale, and have all four complete by autumn. Maybe then plant something nitrogen-fixated and let it grow as long into the winter as it can. Wandering around the Asian food section of Huckleberry’s a couple of weeks ago, I came across a package of Mixed Sea Vegetables, a collection of various seaweeds and such, packed in salt. It’s intended for salads. You rinse off the salt and toss the multicolored chunks with your regular salad fixings. Interesting flavor, and quite different from just crumbling up roasted sheets of nori seaweed. Of course, I had to try it in oatmeal. It was my standard long-cook oatmeal, with no potato thickener. No salt, because even though it was rinsed, it still has a lot of salt flavor. Instead of water, I used seafood stock. It’s by the same people who make the chicken and beef stocks, but is harder to find. Result: Very good, in a sea-side sort of way. The seaweed had enough different flavors that it wasn’t as dominant as the nori oats I tried makeing a while back. A couple of shakes of soy sauce helped. Not something you’d want every day, or even every week, but it makes for an interesting change. I never cease to be amazed at the way Japanese characters change pronunciation and meaning, depending on how they are used. The kanji 女 is pronounced on.na, and means ‘woman‘. The kanji 子 is pronounced ko, and means ‘child‘. When used together 女子 they are pronounced jo.shi (unless the reader pronounces them on.na.ko), and are sort of a group reference to ‘young women‘, but when combined as radicals of a single kanji 好 they are pronounced ko.me (この), which means…’good‘. An 18min John Ford short, shot on the island during the battle. No sign of Dad (they never showed the 37mm’s), and they spent more film on the gooney birds than they did on the Marines. Still, it’s the best presentation that I’ve seen yet on what the battle was like on the island. The narration is in typical wartime style, and you’d never think to listen to it that 70 years later his son would be watching anime and learning Japanese. In two weeks, I’ll be attending a Japanese student’s wedding. For all the pain and suffering and mistakes, that world created this one, and it’s our job to now make the most of the one we’ve been given. Not much going on, garden-wise. Things are sprouting, things are growing. It’s the waiting part of spring, and so far the weather has been very springlike. T-storms in the forecast, so I’ll have to think of some way to protect the plants. I’ve given up on the hops for this year, and have dumped a bunch of butterfly garden seeds on instead. Only my store bought cherry tomato has grown big enough to put out flowers, and all the early ones died. I had an all-day meeting on the first Friday in June, so I’ll have to wait for the last Friday to buy my compost. That’s OK. The peas have started to flower, so I guess it will be another couple of weeks ’till we can harvest them. Then a lesurly week putting together Phase II of the KHG, and we top it all off with half a yard of compost. One lonely spaghetti squash has sprouted in the sprouter. The outdoor ones haven’t shown yet. The weeds are knee high under the cherry tree, and I chuckle at how surprised they’ll be when they end up at the bottom of the KHG.